co_LAB’s pilot intensive workshop, which took place in May 2014, featured collaborations from a number of lecturers and 14 second year students from Media Production, Interactive Design and Contemporary Lens Media. There were also collaborations from Dr. John Murray from School of Social Computing, Louise Lawler (L.S.F.M), a virtual lecture from Chris Heydra (The Hague University of Applied Sciences) and a demonstration of the ‘virtual reality’ system Oculus Rift. The intensive week-long pilot workshop featured students working in mixed-disciplinary groups on a creative design brief, alongside a number of ‘virtual’ pre-workshop activities. The ‘pre-workshop’ phase utilised a variety of cloud-based collaborative tools (Google Drive, Google Docs, Google Hangouts, Facebook, Twitter and WordPress) to enhance relationships between student groups by engaging them in collaborative working partnerships. It was also beneficial for pooling the research undertaken by both staff and students and for sharing information between all participants. The learning objectives of the project include skills in art and media production for 21st century platforms, market research, business planning, pitching, working in multidisciplinary teams and the application of social media services. The project outcomes include the production of a shared online resource, a blog (which would act as a public-facing channel for exhibiting the new ideas and content created during the workshop), and an A1 poster outlining group concepts. These posters were exhibited at ‘As Above, So Below – A Colloquium on Drone Culture’. The project brief itself was kept fairly open so students were free to develop their concepts through whatever medium they felt appropriate. We asked them to develop creative design concepts that respond to the word ‘Drone’. The related topic of ‘drone culture’ was explored, alongside a number of exercises designed to open up potential avenues for conceptual development. To provide inspiration for student concepts the workshop featured a U.A.V demonstration, interactive workshops on mapping and geographical data representation, an exploration of contemporary surveillance technologies, and an overview on the subject of drones from Dr. Rob Coley. 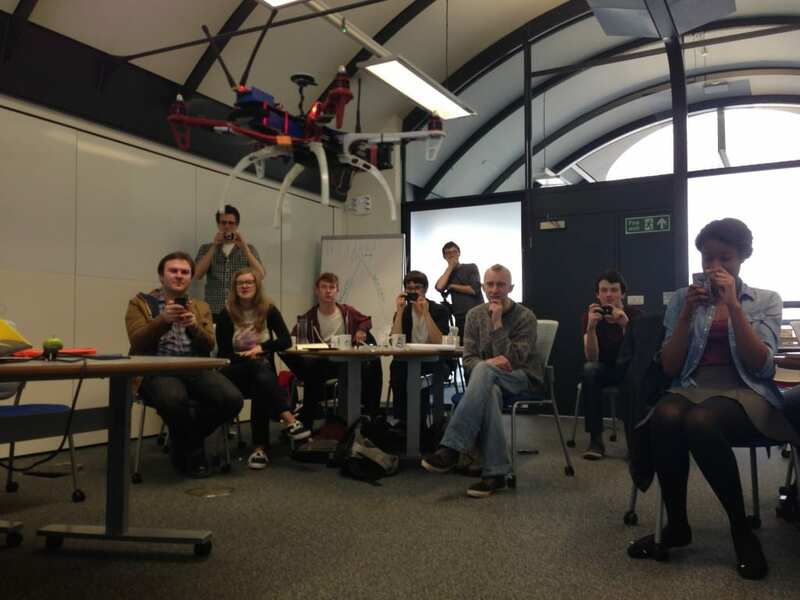 Rather than focussing on the drone itself, each of the three student groups were more interested in the networked infrastructures that shape contemporary society. The students worked collaboratively to interrogate the deeply embedded nature of computational technologies, developing concepts that could explore the new forms of visuality and sociality that emerge from these technological processes.